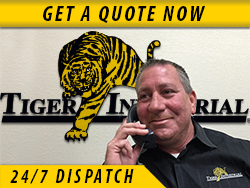 Tiger Industrial Rentals is passionate about providing cutting edge flooring solutions, and our new synthetic/composite ECOmat is no different. 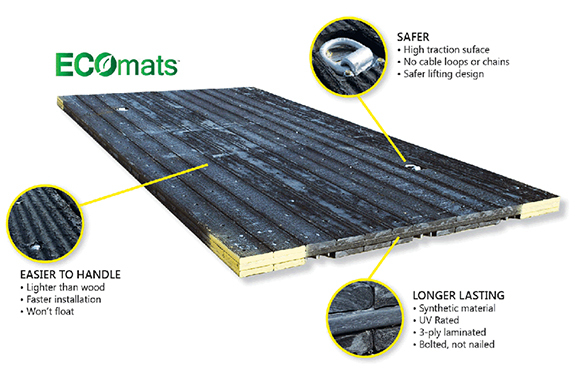 Specifically designed for multiple applications, there are numerous benefits to the ECOmat, beyond the typical composite mat that is widely used in the oil and gas industry today. 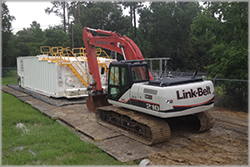 Tiger's ECOmat works well in the petrochemical, utility, pipeline, general construction and oilfield industries. They minimize accidents and provide a safe and stable work surface for heavy equipment and employees, much like our other ground protection mats. The synthetic ECOmat increases foot traction, reduces open spots in pad sites, and reduces cleaning as a result of the closed gap nature of the mat. Minimizes the transference of chemicals or fluids from site to site, including landfills and mass burn sites. This is a critical function of the ECOmat, as compared to a traditional composite mat. Designed to be recycled at the end of its life, so it will never be disposed of in landfills. The ECOmat is bolted, which eliminates issues with nails and flat tires. All ground protection ECOmats meet the criteria for a Class 2 (B) rating, according to ATSM E 84 for flame spread. The ECOmat is made using a proprietary blend of plastic and mineral material. Every ECOmat is made of approximately 50% recycled material, which translates into approximately 1,200 pounds of recycled goods that do not go into landfills. To order ECOmat or discuss a project using other ground protection mats, email us at marketing@tigerindustrialrentals.com, or call us toll-free at (888) 866-0047.